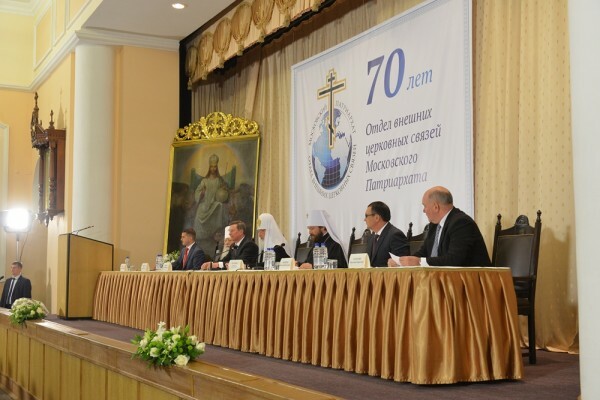 On 19 May 2016, a grand meeting on the occasion of the 70th anniversary of the Moscow Patriarchate’s Department for External Church Relations (DECR) took place at the ‘Danilovsky’ hotel complex in Moscow. The Presidium included His Holiness Patriarch Kirill of Moscow and All Russia; Metropolitan Juvenaly of Krutitsy and Kolomna; Metropolitan Hilarion of Volokolamsk, the DECR chairman; Mr. Sergei Ivanov, head of the Administration of the President of Russia; Mr. Nikolai Fedorov, first deputy chairman of the Council of the Federation of the Federal Assembly of the Russian Federation; Mr. Grigory Karasin, the State Secretary and Deputy Foreign Minister of Russia; and Mr. Yaroslav Nilov, chairman of the State Duma Committee on Public Associations and Religious Organizations. Attending the grand meeting were hierarchs who served as DECR deputy chairmen earlier, namely, Metropolitan Mefody of Perm and Kungur; Metropolitan Platon of Feodosia and Kerch; Metropolitan Clement of Kaluga and Borovsk, chairman of the Publishing Council of the Russian Orthodox Church; Metropolitan Feofan of Kazan and Tatarstan; Archbishop Feofan of Berlin and Germany; and Archbishop Innokenty of Vilnius and Lithuiania. Also attending the grand meeting were twelve members of the Supreme Church Council of the Russian Orthodox Church, and clergymen who represent the Moscow Patriarchate at the international organizations in Strasbourg and Brussels, hegumen Filipp (Ryabykh) and archpriest Antony Ilyin. Attending the celebration were hierarchs and clerics of the Local Orthodox Churches: Metropolitan Athanasios of Kyrene, Patriarchate of Alexandria; Archimandrite Stephan (Dispirakis), Patriarchate of Jerusalem; Archimandrite Feoktist (Dimitrov), Patriarchate of Bulgaria; Archimandrite Seraphim (Shemyatovsky), Orthodox Church of the Czech Lands and Slovakia; Archimandrite Alexander (Pikhach), Orthodox Church in America; and many guests who represented different Christian confessions and traditional religions of the Russian Federation; state and public figures, and ambassadors of foreign states. The grand meeting opened with the speech of His Holiness Patriarch Kirill, who greeted Metropolitan Hilarion and all DECR staff members, remembered with gratitude all DECR chairmen, and addressed warm and kind words to the present DECR chairman and his co-workers. In conclusion, His Holiness expressed his confidence that the DECR will continue its important work inspired by an example given by St. Mark of Ephesus, in whose honour the DECR award was instituted with the Patriarch’s blessing. Mr. Ivanov read out a congratulatory message of President Vladimir Putin, greeted participants in the meeting, and presented state awards to three DECR executives. Metropolitan Hilarion presented a report. While talking about different ministries of the believers, he said that they are valuable and meaningful only when their aim is ‘the edifying of the body of Christ’ (Eph 4:12), the Church. Metropolitan Hilarion emphasized that the DECR had no agenda of its own differing from the agenda of the whole Church, and no other interests than the interests of the whole Church. The DECR chairman presented the medal of St. Mark of Ephesus, 1st class, to His Holiness Patriarch Kirill, to Metropolitan Juvenaly, who chaired the Department from 1972 to 1981, and to Metropolitan Philaret, honorary Patriarchal Exarch of All Belarus, who chaired the Department from 1981 to 1989. Words of greeting were delivered by Mr. Fedorov, Mr. Karasin, Mr. Nilov, and by Mr. Chernikov, head of the Department of ethnic policy, interregional relations and tourism of Moscow.